I'd been hearing a lot about Sloe Gin Fizzes recently. It was showing up in song lyrics left and right. I was getting curious. I knew that it was made with Sloe Gin, and that it was not a less-fast version of regular gin, but I'd never had one. I mentioned to a friend about it, and he said he'd had one before. He also called it a "Lady Drink." Hmm. Well, I'm a lady and I like scotch as well as pink champagne, so that could be anything. 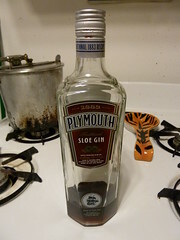 So I mentioned to Fuzzy that I wanted to try one, and in typical amazing Fuzzy fashion, he showed up one night with a bottle of Plymouth Sloe Gin. Each summer, I like to delineate one cocktail or drink to be my "official drink." In an earlier post, I mentioned "The Summer of Flights," and I've also have had 'The Summer of Weiss Beers," "The Summer of Whites" and I think last summer was all about beers. 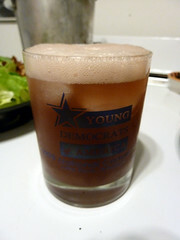 Undoubtedly, this summer is "The Summer of the Sloe Gin Fizz." We killed off that bottle pretty fast and are now onto another one. A few weeks ago, I was out with a few friends and I was telling them about the SGF. My friend Jeff asked where you can get one, since it isn't a commonly consumed drink anymore. It just so happened that we were at a martini bar, so we decided that if they could make us one, we would all order one. They said they could, so we did. It was just good--way sweeter than what we make at home and a totally different color. Turns out, they used sour mix (which I love, but generally when mixed with a cheap whiskey or oooh, apple whiskey. Hey, while I am in this parenthetical moment, I just remembered that last summer was "The Summer of the Whiskey Sour" which I made with Leopold Brothers Apple Whiskey, which isn't as easy to find anymore.) but I must say, I much prefer the ones we've been making at home. Kinda fruity, a little sour, easy to drink and really refreshing. I think I have to make myself one now! Sloe Gin is, simply enough, Gin flavored with sloe berries. Binny's, our local well-stocked liquor store, has two varieties: the Plymouth at $30 a bottle and Dubouchett at $10 a bottle. The Plymouth has been so good I've been hesitant to try the Dubouchett, but I suppose if it's OK, it'd be a lot cheaper. Shake with ice. Strain into an ice-filled collins glass. Top with club soda. This page contains a single entry by Erica published on July 25, 2010 7:13 PM. A Small List of Some of the Amazing Foods Fuzzy Has Made Recently was the previous entry in this blog. Summer Bounty Pasta is the next entry in this blog.